Sure, smartphones are smart. But how smart? Advanced enough to let doctors help diagnose and treat stroke patients who might be hundreds of miles away from where they are. A new study by the Mayo Clinic finds that the quality or brain scans and other medical images sent via smartphone are comparable to those viewed by desktop computers. The results confirm that smartphones can be effective in real-world telestroke healthcare (that is, health care delivered to stroke patients via phone applications). 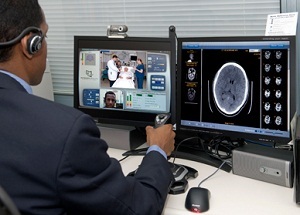 In telestroke care, telemedicine platforms or robots in rural hospitals let a stroke patient be seen in real time by a neurology specialist located elsewhere. Mayo Clinic was the first medical center in Arizona to study telemedicine for stroke patients in non-urban settings, and is now the hub in a network of 12 telestroke centers, most of them in Arizona. “If we can transmit health information securely and simultaneously use the video conferencing capabilities for clinical assessments, we can have telemedicine anywhere, which is essential in a state like Arizona where more than 40 percent of the population doesn’t have access to immediate neurologic care,” said Demaerschalk. So far, the Mayo Clinic Telestroke Network has provided more than 1,000 emergency consultations for stroke. Fast diagnoses of stroke can enable doctors to administer clot-busting medications within the narrow window of time in which permanent injury to a patient’s brain can be prevented. Telestroke care can also reduce costs by avoiding the need for ground or air ambulance transfer of patients to other medical centers. Towards reinforcing telemedicine adoption amongst clinicians in Nigeria. Local innovation for improving primary care cardiology in resource-limited African settings: an insight on the Cardio Pad(®) project in Cameroon. Are inexpensive smartphones the future of ICT4D?